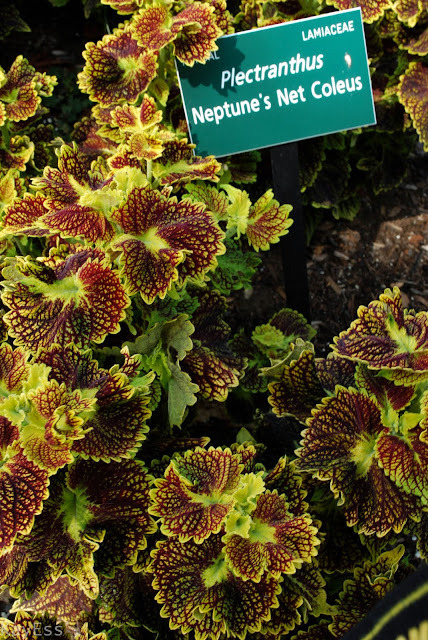 Coleus..some are Solenostemon, and apparently some are Plectranthus. I can't keep up. My friend Deanne began collecting Bromiliads a few years ago, and I can tell you she does not do things halfway. When I visited her splendid New Hampshire garden in August it was pretty clear that she has a gentle addiction going . 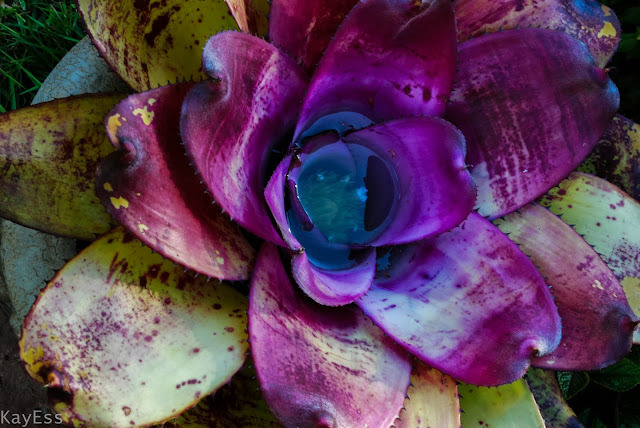 Her artistic sensibilities inform the design of her gardens: color palettes are just right, and flow seamlessly from one area to another. My frankly undisciplined approach to plant shopping never seems to yield this type of cohesive result. Deanne has incorporated her Bromilaids into her borders and container groupings so that the color echoes shine..and here is my disclaimer-as I strolled around Deannes garden with my camera I never wrote down a single name--this is an anonymous Bromiliad post. Visit Deannes blog and you will most certainly get a better education. All of my photos of this one are out of focus, but I had to include it here anyway ..is this not outrageous ? This week I'm honoring the lowly Ipomea 'Marguerite' , who has engulfed a large segment of the Succulent Alley . You have to give her credit for tenacity. No doubt she pines away for the good old days when she was a new and exciting selection at the garden center. This area really was all about the succulents, and one day it seems I turned around and there was Marguerite , creeping relentlessly among the Agaves . She's heading for the open garden. Who knows where it will end ? 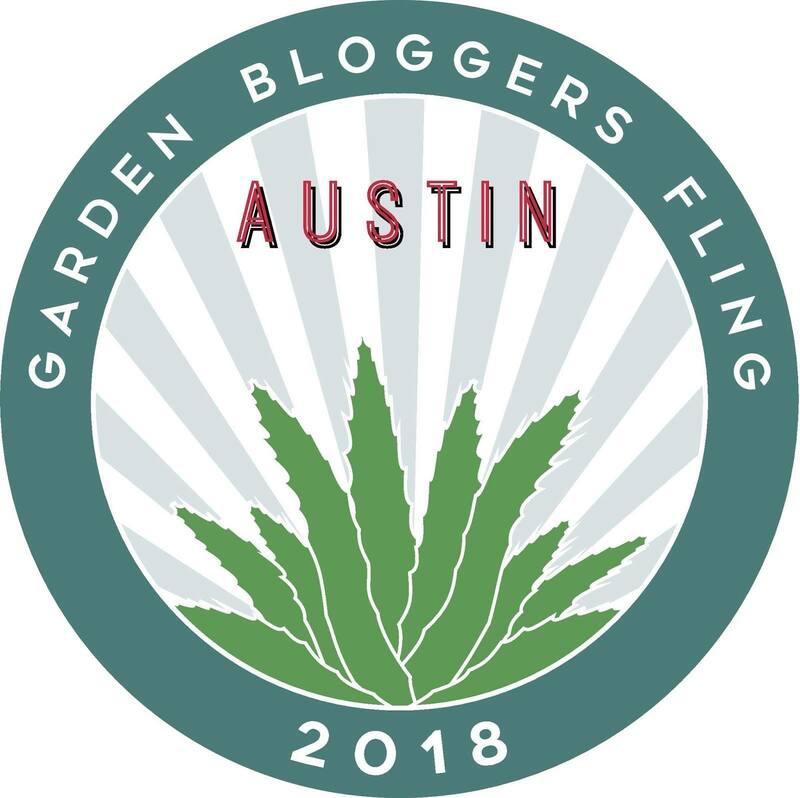 Loree over at Danger Garden is our sponsor for this event...check it out ! 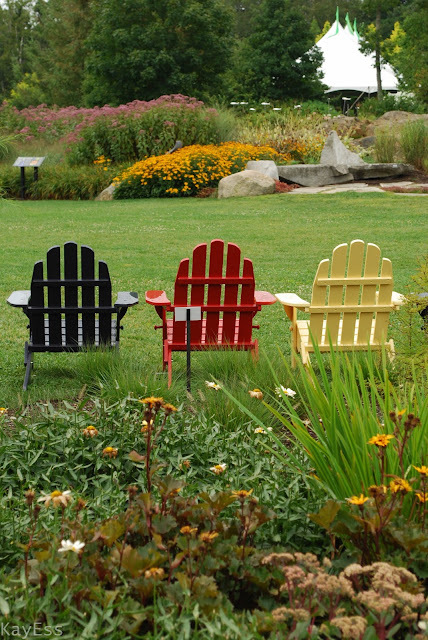 I can't really explain why this area at Coastal Maine Botanic Gardens was so compelling to me. 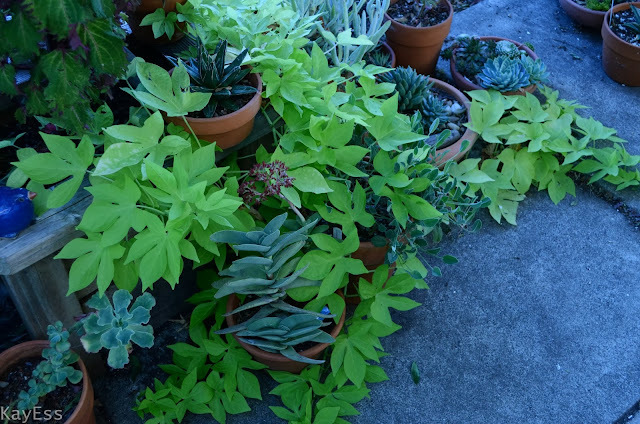 Maybe because the combinations seemed slightly unusual, featuring a few plants I don't see out here in the west , and it seemed accessible..something I might actually be able to do , even if it has to be on a smaller scale with left coast friendly substitutions. . This is a distant view of 'my' section ..it sits at the base of this structure , not looking like much from this perspective. As I moved closer, the grouping started to take form. 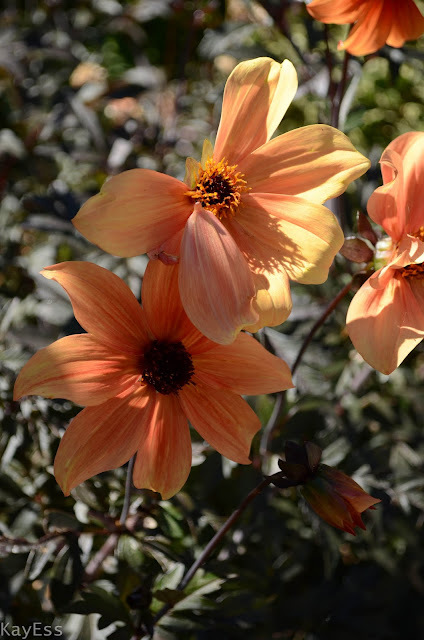 It's a challenge to come up with a favorite during the late summer garden-exhaustion period. The post-office WALAT (Walking Around Looking At Things) yields a laundry list of potential fall garden demolition projects. I'm going to be busy in October. 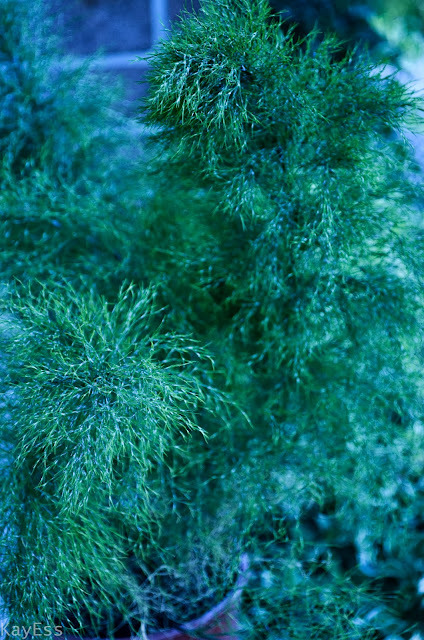 So, my favorite plant this week is the new Restio I brought home yesterday, Ischyrolepis subverticillata. Hardy to 20-25 degrees, I am pushing the envelope with this one; but thanks to an employee discount This one gallon plant only cost me 6 bucks, and I expect I will have gotten at least 10 bucks worth of enjoyment out of it this fall even if it bites the dust this winter. Hell, you can't even buy a beer at the ballgame for 6 bucks, and that only lasts a half an hour-give or take 15 minutes. My favorite feature of September is that it's no longer August. Though the garden still suffers from the late summer blues, I can recognize the softening of the light and the subtle changes that exhausted plants begin to display. Here in Northern California wine country we have several weeks before the cool temps set in , and high 90's (or worse) heat is still an occasional visitor. The Mystic series Dahlias have been outstanding performers in my garden- seen here is Mystic Spirit. The deep bronze foliage is still as clean as it was in spring, flowers are abundant. Stems are strong and I have never had to stake this plant. I plan to add more of the Mystics next year, though I have found that not every variety in the series is as vigorous as this one. I've been extremely happy with this Persicaria this year, but it clashes horribly with many other plants in it's immediate area. This fall I will replace it with P 'Golden Arrow'. Though I was in Maine for just a little over 24 hours during my mid-August visit, I managed to to bring home several hundred photos on my memory card. 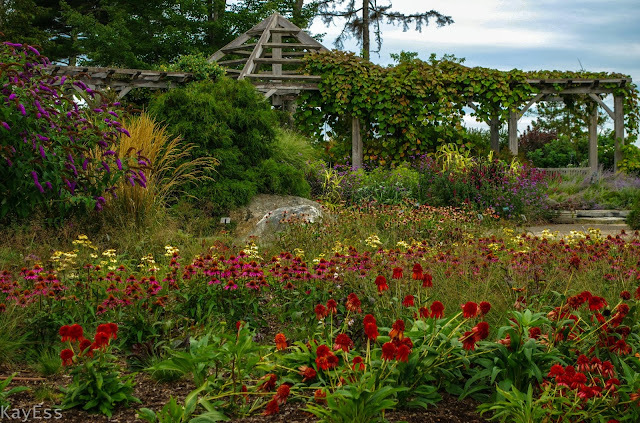 This was my second visit to The Coastal Maine Botanical Garden , and I was prepared with extra batteries, extra sd cards, and comfortable shoes. Read my post about the Childrens Garden here, and a brief recap of my previous trip to Maine here. All the hardscaping is beautifully done here, and the stroller is led effortlessly around ponds , over bridges, with a different view from each of the discretely suggested pausing spots. On my last visit, these planted walls sported coleus as I recall. Loved this Thyme cluster. The summer perennial borders were fabulous; I'm helpless when confronted with these wide swathes of color and texture. The vegetable garden area was in full summer chaos.. with ornamentals tucked in for emphasis. More to come from this outstanding garden..
Nickel and Nickel is a premium Napa Valley winery in Oakville, specializing in single vineyard wines. The buildings on the winery site are classic barns and outbuildings along with a restored Queen Ann farmhouse dating to the 1880's , all beautifully landscaped and meticulously maintained .The story of the buildings can be read here on their website, along with information on their wines if you are so inclined. A few years ago, they began to garden the strip of land out side the fence that borders Highway 29. 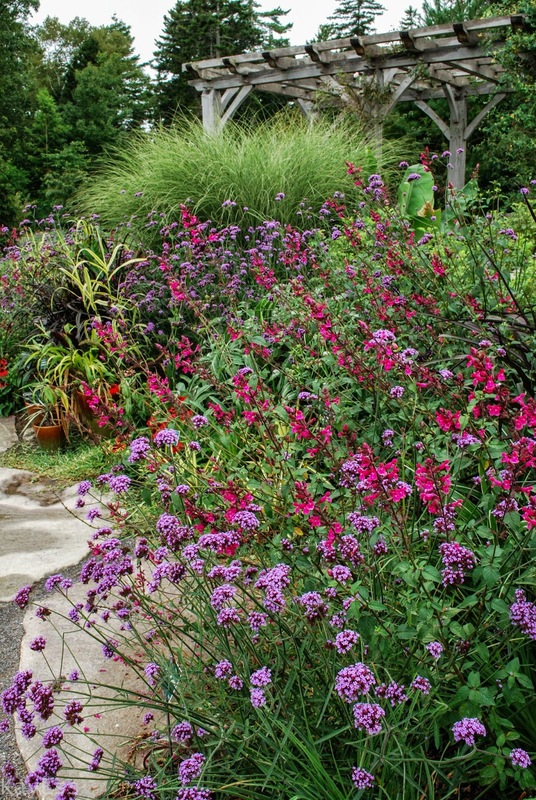 This planting has become a focal point for passers-by --it is dramatic and colorful. I often wish more winerys would copy this for a solid wall of summer gaudiness. 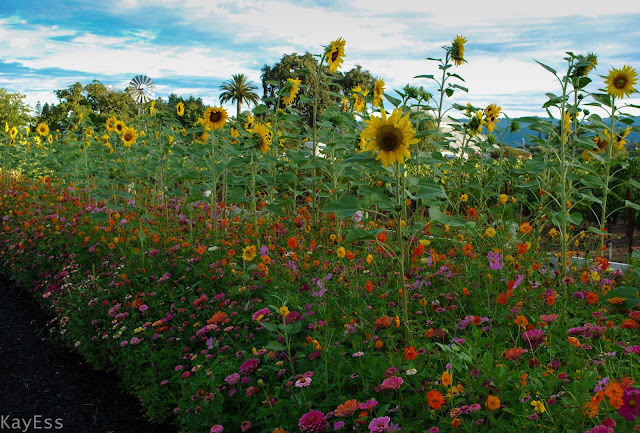 Daniel Thomas, the landscape designer here, has custom seed mixes made to his order. And yes, this is all grown from seed .